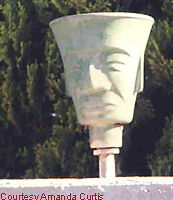 This Pool Lamp is one of many that once surrounded a pool in a Mobile Home park in Tucson, AZ. What an interesting looking lamp. 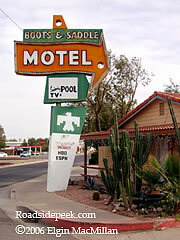 Here's the googie like Jacaranda Resort Apartments of Scottsdale, AZ. This "resort" complex is within walking distance of downtown Scottsdale. 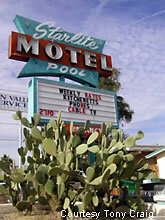 Here's the marquee next to the motel office for the Starlite Motel in Mesa, Arizona. At this property right off the roadside, there are not just one but two fancy marquees. The swimmers (right) even still light up at night as the animated neon gives the impression of the swimmer diving off the top of the sign. 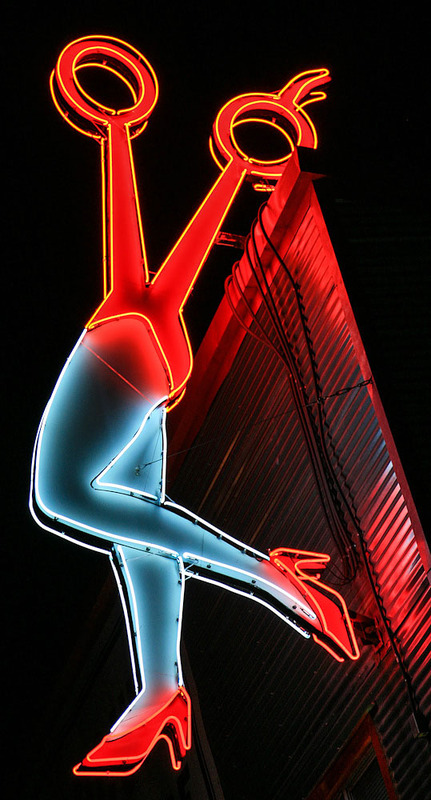 UPDATE 10/10 : The Starlite Motel lost its animated neon diver sign in a thunderstorm on October 5. According to the Arizona Republic, the 50 year old sign was destroyed when a powerful wind gust sheared off a metal pole support. The motel owner states the sign most likely will not be replaced due to funds required and Mesa's sign ordinance. Another roadside treasure has become just a memory. 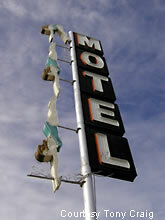 See more information and photos at Roadside Peek's Spotlight feature on the Starlite Motel. 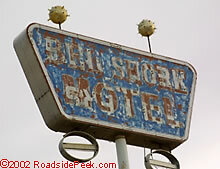 Well, the El Rancho Motel may still be in business but this one is not. The Bell Shore Motel appeared to have some significant fire damage. The marquee still stands. 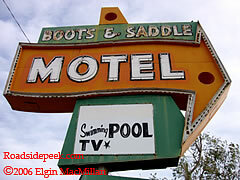 (Near right) A close up of the Boots and Saddle Motel marquee and interesting lettering advertising the "swimming pool"